Create a funny ghost virus and installs it on your friend's PC to have some fun. It will automatically starts some windows processes like it will open notepad and start writing in it automatically. OK its time to make some fun with your friend if you have access of his PC for some time. Just create a simple windows script to automate the keyboard typing event in this way whenever your friend will open any writing column(e.g notepad, word-pad or office etc.) 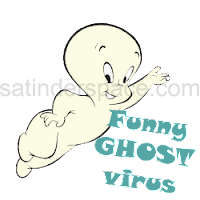 or a space where he can write this script will automate start writing as setup by us in this script, So I name it - a Ghost Virus, where a ghost will start write on your writing space(notepad, word-pad, Microsoft office, etc.). wshshell.sendkeys "just open task manager "
wshshell.sendkeys "and kill or end "
wshshell.sendkeys "you fail to stop it "
This script will automate start notepad and start writing as mentioned in the script e.g. you can see ( "There" "is" "a" "Ghost" "Around" ), this is the text that script will automate write on your friend's PC. You can change this text to make your custom script. wscript.sleep 400 is used to mention a time after which Ghost will write a text in your friend's writing space. Change 400 to change the time. wshshell.sendkeys "HELLO " is used to change the text that ghost will write, Change "HELLO " with any text you want. If you delete the loop from the end then this script will stop after one cycle. You can adjust it according to your requirements. Save this script with .vbs extension like "ghost-virus.vbs"
Now its time to test it just double click on it and see the real magic. Now there is a ghost around you. To make it more dangerous just place it in windows start up folder and this script will start automatically when your friend will start his PC. Start task manager by pressing ALT+CTRL+DELETE or start it by right click on your windows Task-bar. Also delete it from windows start UP folder to stop it running every-time when you start your window PC. If you love to have fun with your friends then like and share this post and try this script with your clean hands (only for fun). Once more it is wscript.exe process in task manager which will stop this viral script.